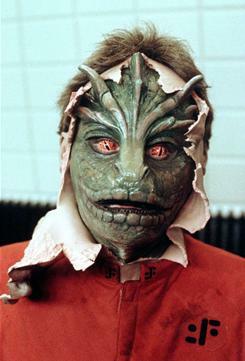 a) In the 1983 TV mini-series, extra terrestrials land on Earth in giant mother ships, they at first appear to be humans but soon are revealed to be reptilian aliens disguised as humans interested in only draining the planet of its resources and harvesting the human race as foods. Soon ripped skin would betray their hidden faces. 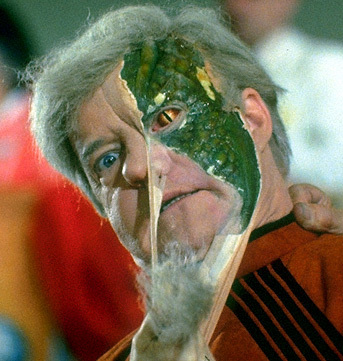 Soon ripped skin would betray their hidden reptilian faces. 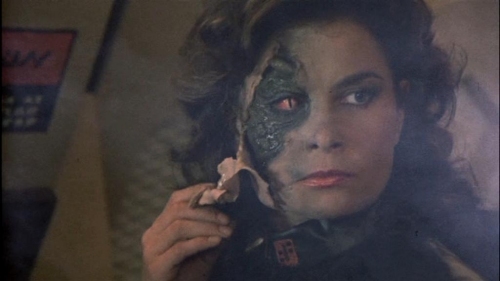 b) This preceded the film Communion that shows underneath the face of the alien referred to as "the Visitors" loosely based on Whitley Strieber's experiences as mentioned in the book Commununion.